HestaNet ehf is the name of our company and it is owned by Sandra & Raggi. 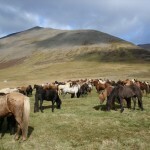 The main purpose of HestaNet is quality breeding the Icelandic Horse, training, riding lessons and salehorses, both our own horses and from others. HestaNet offer to take horses for boarding and to stay with our herd and feed them the whole year. This service is for youngsters, riding horses and pregnant mares. It´s necessary that all horses that are coming to us are fully insured. 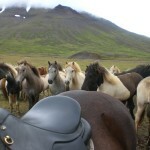 During 2009 HestaNet started to offer riding tours in Iceland. The riding tours are located to the farm Efri-Mýrar and with clinics and ridinglessons in an indoorarena and free riding in the amazing icelandic nature in a great mix. 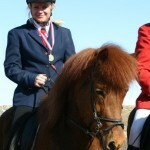 In september each year we have the big horse Round Up in Skrapatungurétt. We put all our youngsters to the mountains during the summer and they live free in big herds in the huge valley Laxárdalur. About 700 Icelandic Horses are brought home from the mountains and it will be possible to participate in this big adventure together with HestaNet and the the swedish company Flygande Pass HB in Stockholm.